The symptoms of a sore throat can include pain, scratchiness or irritation of the throat or pain on swallowing. The most common cause of a sore throat (also known as pharyngitis) is a viral infection, such as the cold or the flu. A sore throat often resolves on its own1 and symptoms typically last for about a week 1,2. In fact, most people improve or get better without antibiotics whether the cause is viral or bacterial2. According to Dr Johannes Claassen from the Universitas Academic Hospital in Bloemfontein, not only are antibiotics over prescribed, but the antibiotics chosen are often more expensive and of a broader spectrum than needed3. Approximately 75% of patients who go to their doctor with a sore throat will be prescribed antibiotics, even though this will only help a minority of patients4, simply because most colds and flu are caused by viruses. Infections such as strep throat can be effectively treated with antibiotics as this is caused by bacterial infections5. However, a sore throat caused by a bacterial infection can improve without antibiotics after a few days2. Many symptoms of a sore throat can be managed through self-care. This includes the use of aspirin or paracetamol which can be effective in reducing pain and fever associated with an upper respiratory infection2. 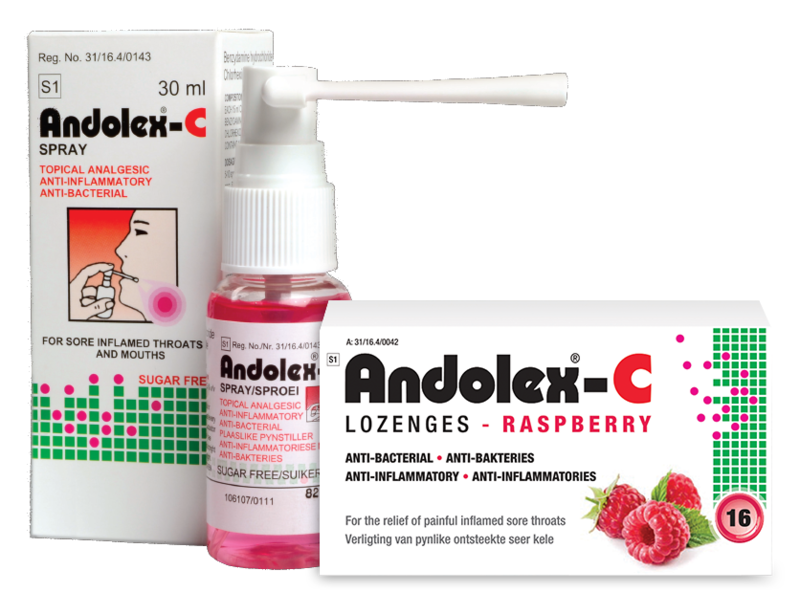 Medicated throat sprays or lozenges such as Andolex-C can help alleviate the intensity of symptoms and provide fast effective relief 6-9. Should symptoms of a sore throat, cold or flu get much worse or show no improvement within a week, patients should see their doctor2. Linder JA, Stafford RS. Antibiotic treatment of adults with sore throat by community primary care physicians: a national survey. JAMA 2001;286: 11811186.